New opportunity for Salmon and Sea Trout members this year, Saturday Junction rods, please book on the CADAC forum! Members registering for the club forum must use their real names as their username. Registrations using screen names will not be activated. Please note: There will be a £10 admin charge for payments received after the 3rd of March. 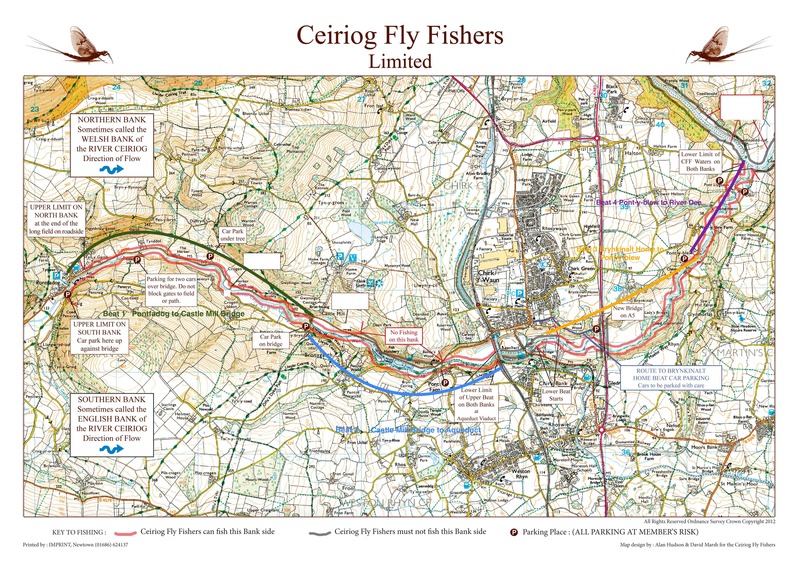 Click on the map above to open the Ceiriog River Map page for information on the river, the beats, access roads directions and parking. There are specific rules to be followed when fishing the Ceiriog beats. Members must familiarise themselves with these rules before fishing. The principal fishing rule is that dry fly, wet fly and nymph only are allowed, and barbless hooks must be used. No Brown Trout less than 23cm may be taken, and all Grayling are to be returned. Different guest rules apply to the Ceiriog - members may take up to one guest per week and need not give prior notice to the club. Beat 1 - Pontfadog to Castle Mill Bridge – double bank fishing for both wild and stocked Brown Trout. Beat 2 - Castle Mill Bridge to Chirk Aqueduct - double bank fishing (except for part of north bank at Chirk hatchery and fishery) for both wild and stocked Brown Trout. Beat 3 - Brynkinalt to Pont-y-Blew (Forge Bridge) - double bank fishing for wild and some stocked Brown Trout. Finding the access to the top of the beat is not easy, detailed instructions on how to find access will be added to the beats page. IF THERE ARE ALREADY TWO PARKED CARS PLEASE FISH ANOTHER BEAT. Beat 4 - Pont-y-Blew (Forge Bridge) to river meet with River Dee - double bank fishing for mostly wild Brown Trout and Grayling. This beat joins the lower end of the Coed yr Allt beat and is easily accessible from that beat. CADAC relies upon the goodwill of members to assist in general maintenance work relating to the fishery. Constructing benches, stiles, walkways, clearing fallen branches and habitat work are just some of the tasks involved. There are effectively 3 working parties active on CADAC waters - a Sunday and Wednesday group and a Balsam clearing party which operates during the Summer months. Members attending at least 4 working dates are entitled to certain privileges. CADAC have secured the use of an exclusively Private Beat and only the Work Party members may fish it. Furthermore, access to one of the most productive Salmon pools is restricted to Work Party members only during the last full week of September - we also have an annual Working Party lunch. If you're a member of CADAC please do your utmost to join these Parties.......we will all benefit! The Open Day date is Sunday April 7th 2019, 9:30am for a 10am start. Meet at the Sports Pavilion Corwen. Contact Harry Carr at [email protected] to book. Members must confirm attendance with the Membership Secretary. This can be done by mailing [email protected] or phone Harry Carr on 07767 159086. Please be aware that it is a mandatory requirement that all new members must attend the Annual Open Day in order to familiarise themselves with access, parking and boundaries etc. Any member joining after the Open Day must attend the subsequent Open Day. In order to enhance the membership experience of CADAC anglers we offer various free tuition days - one such event is the Double Handed Salmon Day. Derek Turner, an AAPGAI qualified instructor, will again be hosting this tuition session. Derek will demonstrate and teach the rudiments of this fine art. The date for this event is the 12th of May 2019, meet at 10am at Chain Pool. Please contact Derek directly on 07813 352 475 to book on as places are limited. In addition to the Double Handed casting tuition and to offer our members comprehensive instruction we have also arranged a Single Handed casting session. Chris Aldred, a GAIC/APGAI/FFF qualified instructor, will demonstrate and teach the casts required for optimising the river fishing potential of CADAC members. To book on leave you name on the Single handed casting day thread on the forum as Chris is away till the 2nd April and won't have his phone on. Places are limited. CADAC members are issued with an allocation of 2 Guest Tickets per season - there are no charges for these tickets. They allow the guest to fish for Trout and Grayling only, they are dated and are only valid for the date on the ticket. The member to whom the ticket is issued to may fish for Salmon when accompanying the guest. The member is responsible for the conduct of the guest and must accompany the guest at all times - both anglers must be on the same Beat. Please contact Club Chairman Gareth Jones to book guest tickets, e-mail [email protected] or text 07824504796 if possible, failing that phone. Please do not wait for a response, sending the message will be proof of the booking. Please include name of guest and date required. Thanks to the assistance of dedicated volunteers, CADAC provides a full day of fishing instruction on a monthly basis. We are extremely fortunate to have professional instructors, Level 1 and 2 coaches who teach the youngsters the finer points of fly fishing. All participants each get free membership to CADAC for the season and the instruction days are all free of charge. For more details simply follow the instruction on the 'flyer' above. Salmon fishing only from the 3rd March to 31st August. These tickets are available on Mondays, Tuesdays, Thursdays and Fridays only. Trout and Grayling tickets are available 7 days a week and all year round (seasons apply). Tickets numbers are restricted and will be issued on a 'first come first served' basis. Please note: The Fechan and Lingo pool (A5 side) will be excluded from the water share as these are restricted to members only. CADAC offers day tickets on the Crogen 1 Crogen 2 and Crogen 3 beats. Tickets are available from two Corwen outlets namely GM Hughes the Newsagents - Tel: 01490 413185 or Corwen Manor Tel: 01490 413196. The price of each ticket is £20 per day.